I always seem to find out about fun annual events a bit too late. 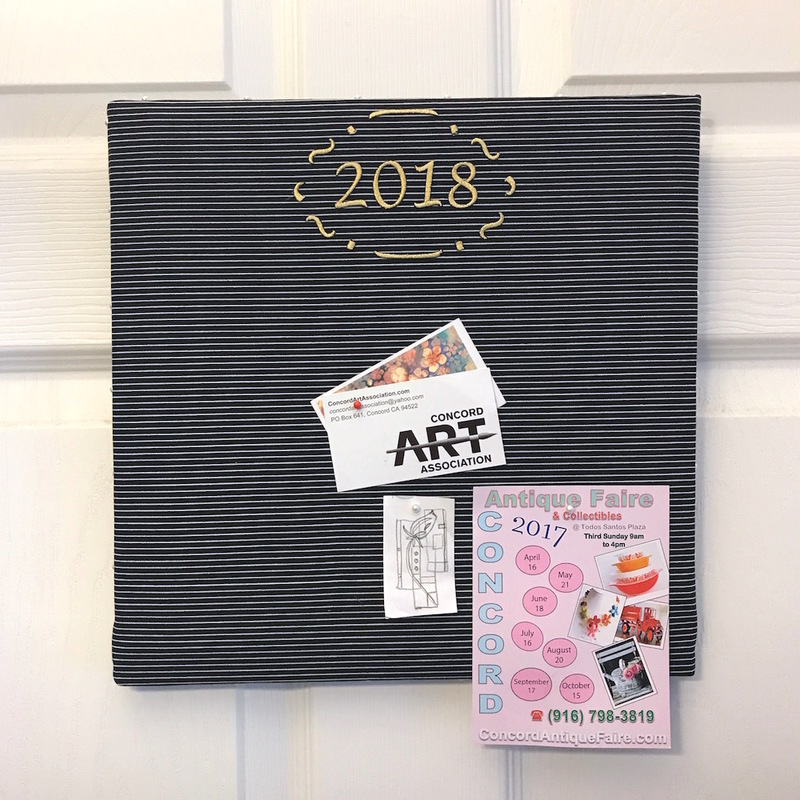 So I thought a special little bulletin board just for things I want to do next year made sense. From special events I want to attend, to clubs I want to join, to things I want to make - now I have a special spot to tack a reminder until later in the year when I'm ready to load up a new day planner. 2. Carefully press and hold the iron down on top of your design for several seconds. Lift and press again a couple more times to ensure all the pieces are adhered. 3. 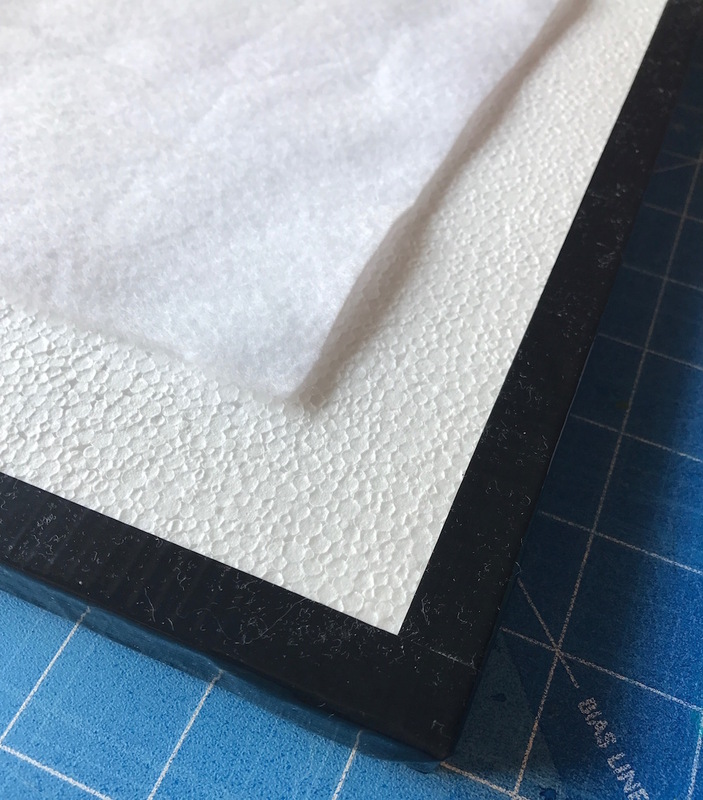 Wrap the edges of the foam sheet with duct tape, then place the felt on top. 4. Wrap the fabric around the foam, keeping the iron-on numbers centered at the top, and pin into place around the edges. 5. Pin or tape the fabric edges against the back of the foam. 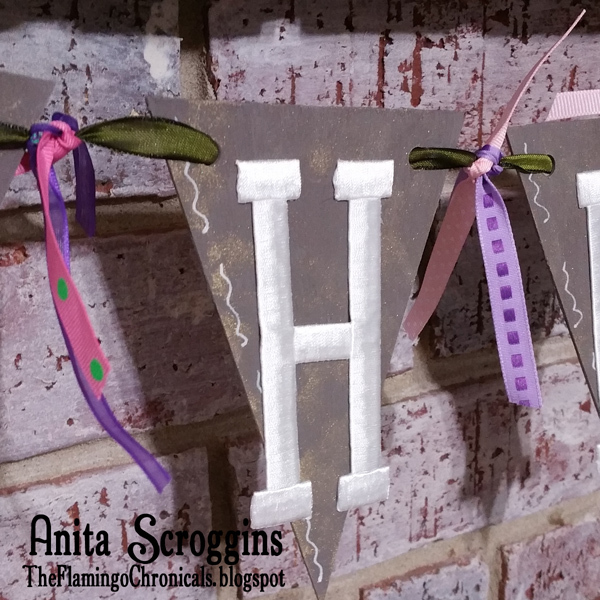 Pin a loop of ribbon on the back for a hanger. 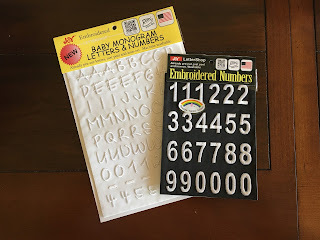 You can find Joy® embroidered iron-on numbers and letters in a variety of fonts, colors and sizes at your local craft store. It's time to get ready to go back to school and every little girl wants to put her best foot forward! Monograms are everywhere. From jackets to snuggly robes; table napkins to tea towels; tote bags to T-shirts and everything for "Back to School". 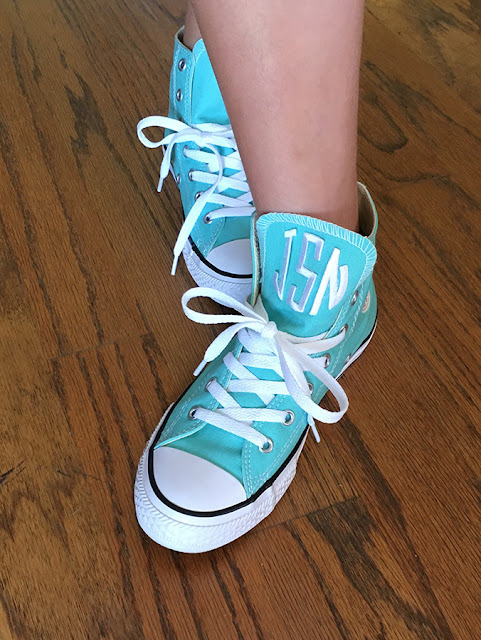 My granddaughter couldn't wait for me to put her initials on her new shoes to make them even more fashionable. There were lots of styles and sizes to choose from, but she liked these circular ones best. Since we were putting them on her shoes, I used fabric glue to adhere the letters instead or ironing them on. We let them dry then sprayed the shoes with a waterproofing spray. 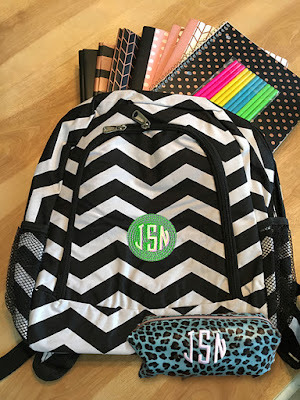 She liked the monograms so much, we also added them to her book bag and a pencil pouch. The letters are dyable, but, as you can see, she's very trendy and likes them just the way they are. 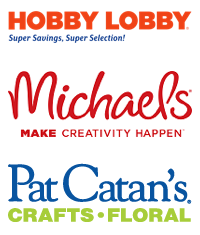 in a wide variety of fonts, sizes and colors at your favorite craft store. The nice thing about this wedding monogram sign is that it can be adapted for any occasion, including an anniversary, a new birth, a new home or even the start of a new job. It's quick and easy to make in just 15 minutes - enjoy! 1. Center your large monogram letter on the chalkboard and glue into place. 2. Lightly sketch some vines around the letter and fill in your design with the pen. 3. 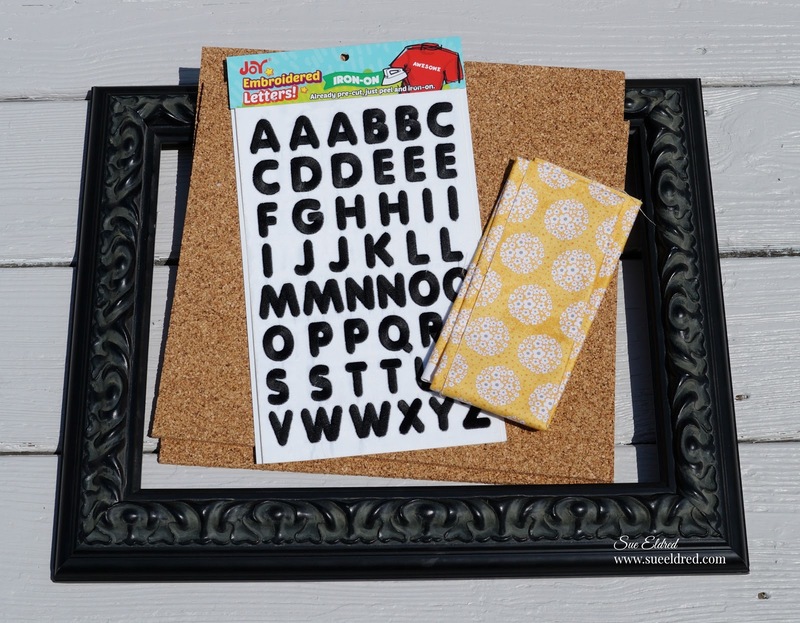 Arrange and glue the rest of the letters and numbers at the bottom of the chalkboard. 4. Use the pen to further accent the sign as desired. I added hearts to signify there are 3 of us in our family. It's all about dinosaurs at my house right now. We have a grandchild's birthday coming up and what could be cuter than this dinosaur birthday banner? 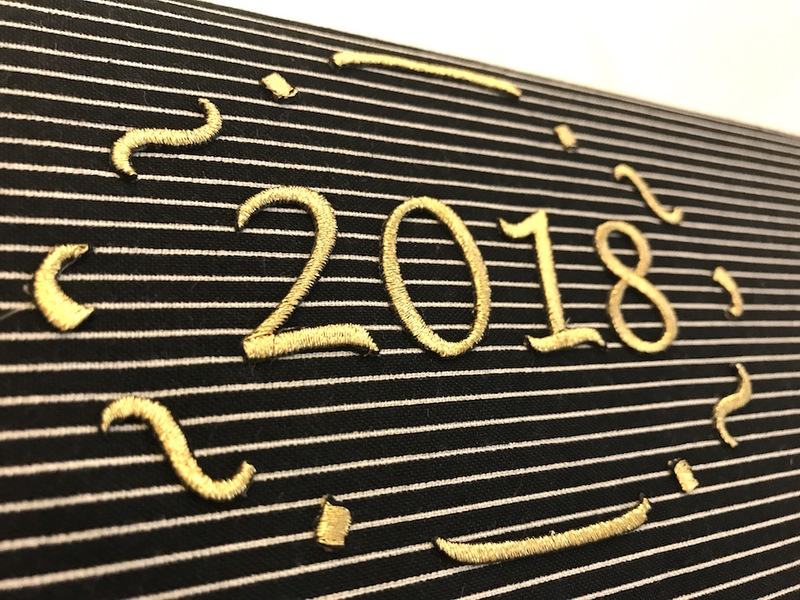 Because I have so many projects I want to complete before the big day, I took advantage of a few ready-made pieces to bring this banner together quickly - including Joy iron-on embroidered letters. I painted each chipboard piece in the background color, then added some gold highlights to each one. When dry, I used a white paint pen to add a few details. You can certainly iron the letters onto the chipboard (I have done that before) but for the sake of speed, I used doubled-sided tape to attach the letters. 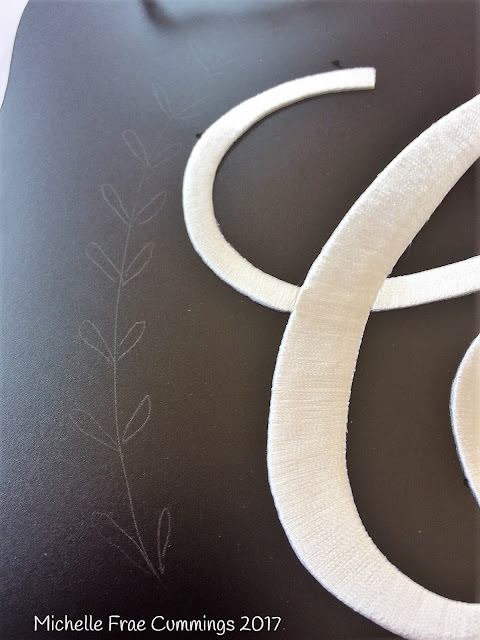 Use hot glue to attach the wood pieces to the banner sections on the ends. 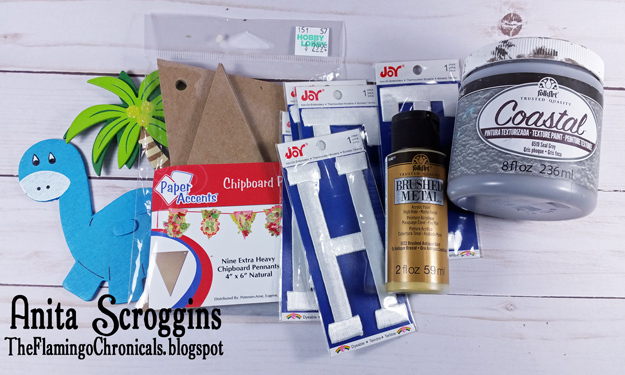 Run a long ribbon through each of the chipboard pieces along with some smaller pieces of ribbon between each banner section. Done and ready to party! 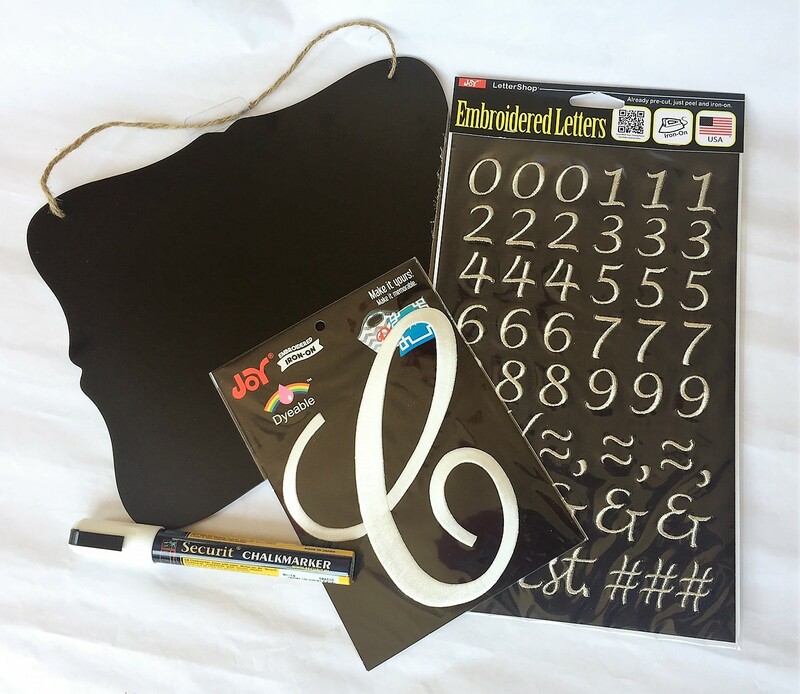 Joy embroidered iron-on letters are perfect for just about any surface - so they're great for making quick gifts and thank-you cards. Give thanks with Joy! 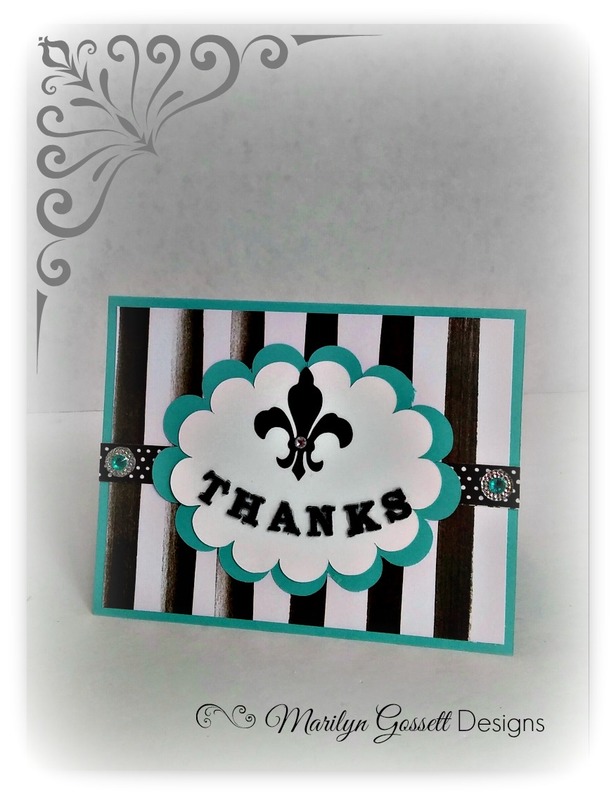 Striped panel: 4 x 5-1/4"
Scalloped ovals: 4" and 3-1/2"
Fleur de lys die-cut: 1-1/2"
2. 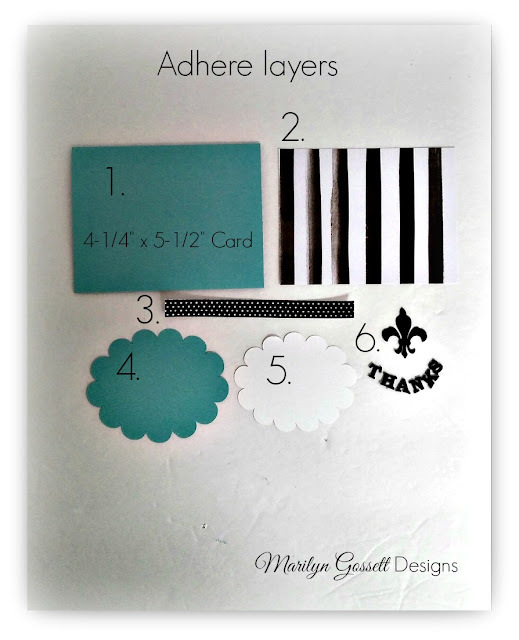 Arrange the layers as shown in photo below. 3. Assemble the card and adhere layers in place; glue the letters (or press with a hot craft iron) to spell THANKS. Add the rhinestone embellishments. 4. 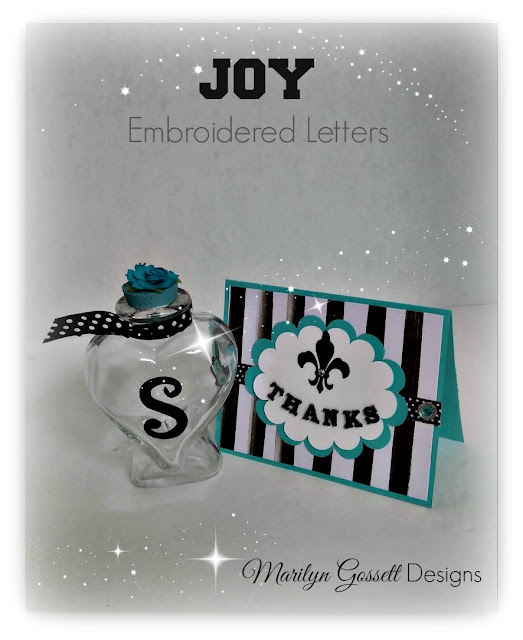 Add a larger Joy letter to a decorator bottle for a personalized thank-you gift. Fill the bottle with candies or bath salts. Back-to-school usually also means the beginning of cold & flu season. I used to send my daughter to school with her own personal pack of travel tissue, but she always shoved them into her book bag carelessly, which ripped the cheap, plastic covering and the tissues would end up getting dirty and unusable. Once I started making fabric travel tissue holders for her, the tissues stayed in place because the fabric was a bit tougher. I also think my daughter might be more careful with the fabric tissue holder because...Hello! Cuteness! This year, I'm planning to personalize her tissue holder because she tells me she's kind of famous for always sharing a tissue when someone is in need and, if the tissue holder get passed around, it's sure to come back to her eventually if her name is on it, right? 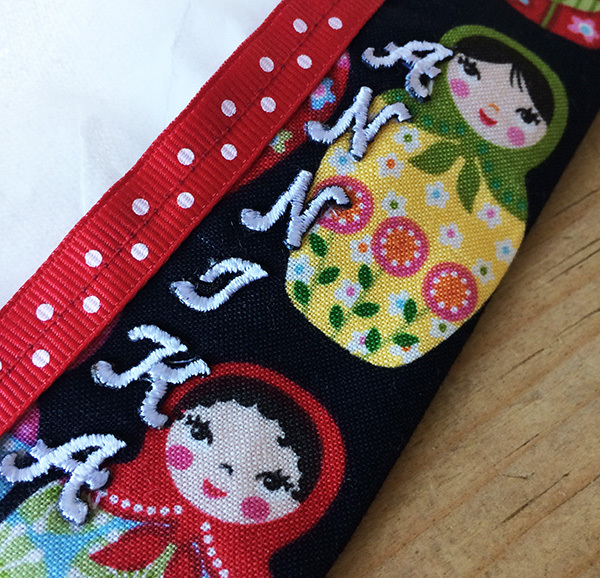 Pin fabric pieces together, right sides facing each other. Sew 1/4" around the outer edge. Leave a small opening on one long side. Turn the fabric right side out and press, making sure your opening is pressed inside. 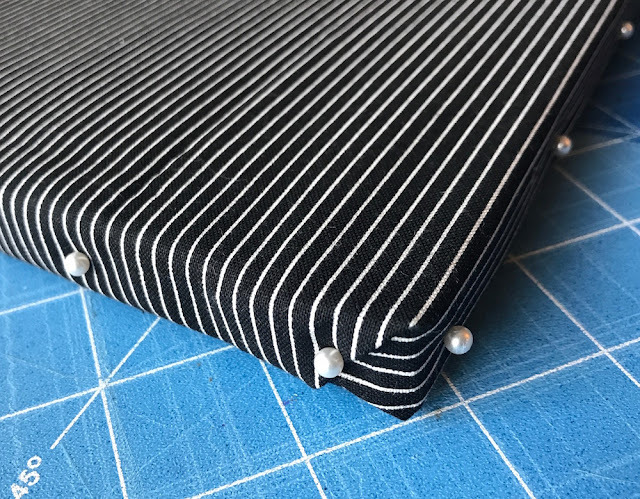 Lay the square, outside fabric facing down, on your ironing board. Fold short edges towards the middle, so the edges meet each other. Press in place. Stitch the ends down. Turn cozy right side out. Remove the Joy letters from the sheet and arrange them in place. 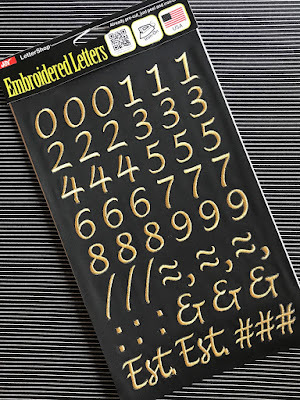 Cover with a pressing cloth, then iron-on the letters for 30 seconds. Allow to cool for 1 minute before you handle. If you want some tips for how to prepare for the cold season, check out my blog post on the topic. Stay healthy! Make family time more special with this cute memo board. Now that the kids are starting to head back to school, weekends are more important than ever - it's nice just being together. 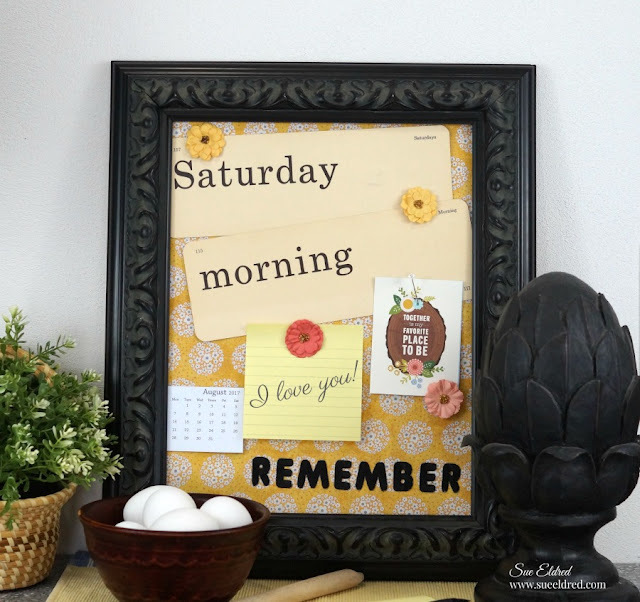 Whether I post a reminder about a fun event or a special note to say "I love you," this memo board helps me remember that Saturdays should be a little more laid back - just the way I like it. Measure and cut the cork tiles to fit inside the frame. 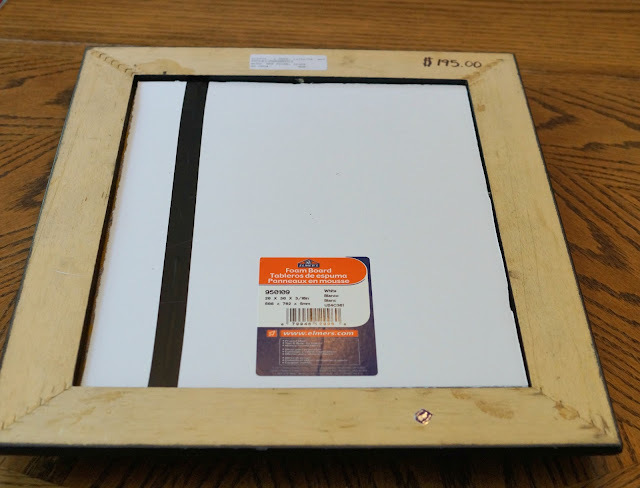 Because the inside of my frame was deep, I cut a piece of foam board the same size and glued the cork tiles to the foam board. 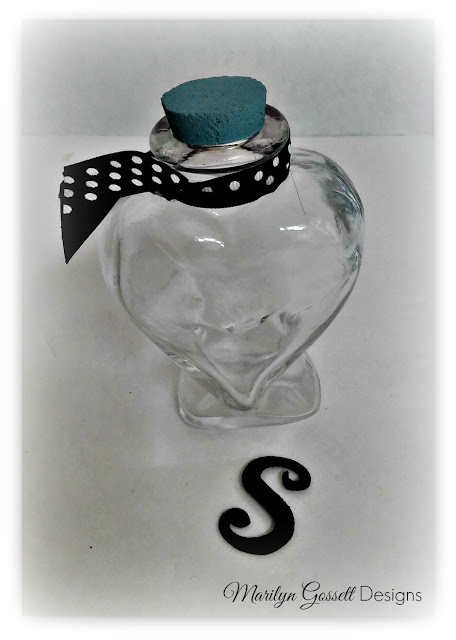 Lay the fabric over the cork to determine letter placement. 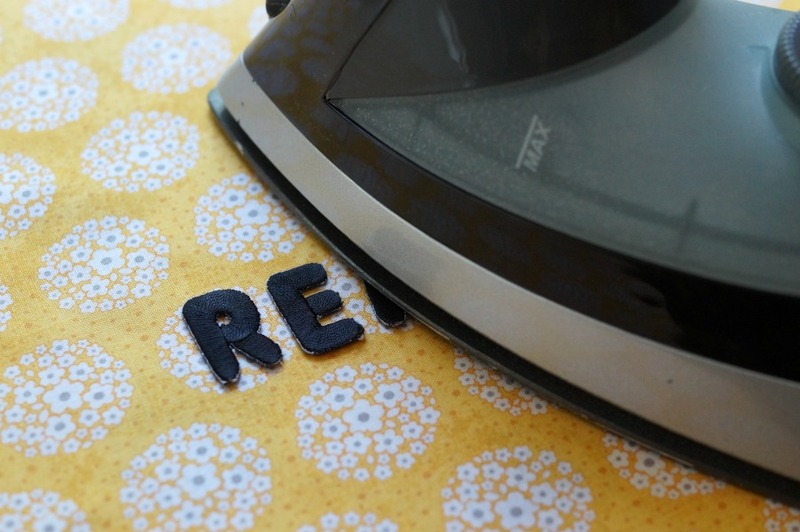 Gently slide the cork out from underneath fabric and iron on the letters. Spray the cork with adhesive and smooth the fabric over it. Tap in a few tack nails inside the back of the frame to hold everything in place. Make a set of DIY baby date blocks for the newest mother in your life. She can use them to count down to her delivery date, then again to celebrate each week of her baby's first precious year. 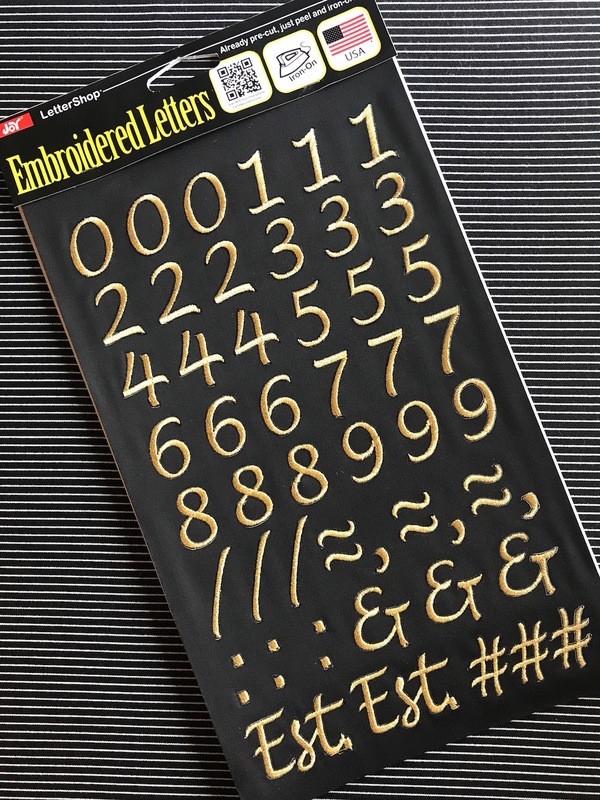 With so many different styles, sizes and colors to choose from, you're sure to find the perfect style of Joy embroidered letters you like! 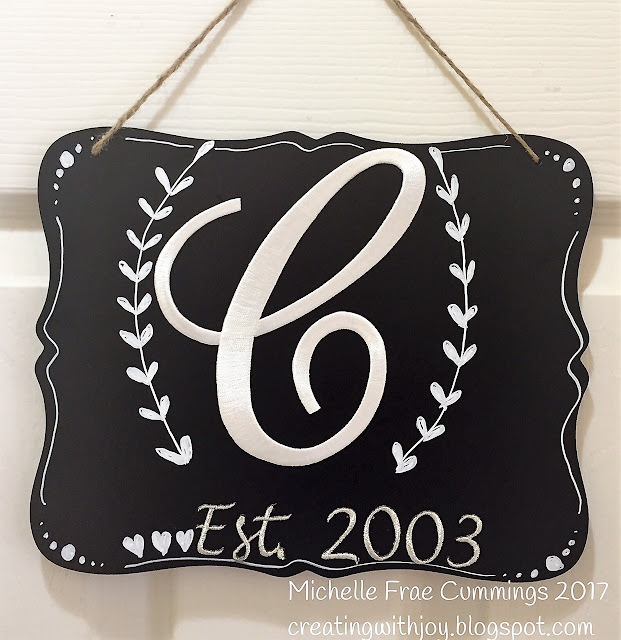 You can color the white letters with dyes, pens or paint. 1. Glue two blocks together to make the base. 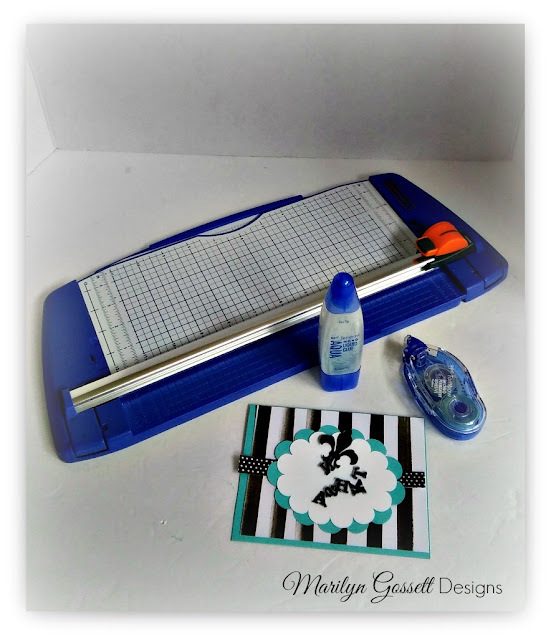 Trim your scrapbook papers into squares to cover all sides of the base, as well as the remaining two cubes. 2. 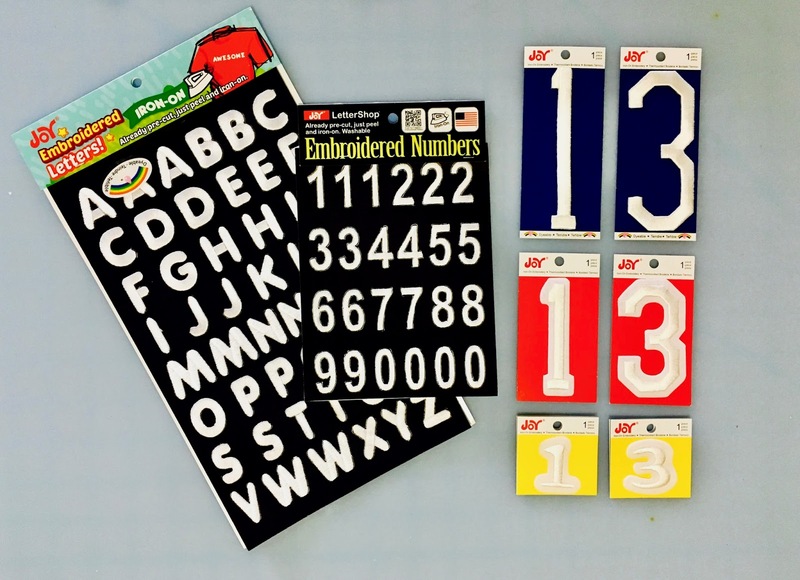 Remove the backing from each letter and or number to expose adhesive, then press in place. 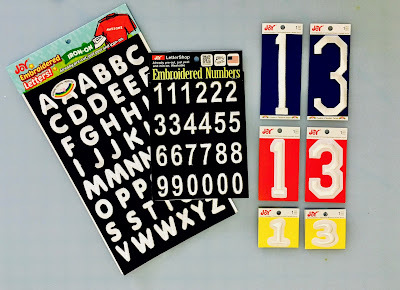 (The numbers (0-9; one per side) and the letters (to spell "weeks") to the papers as shown. If using letters and or numbers from a sheet, gently press in place with a craft iron and a pressing cloth to protect the paper. Letters can also be adhered with tacky glue. 3. 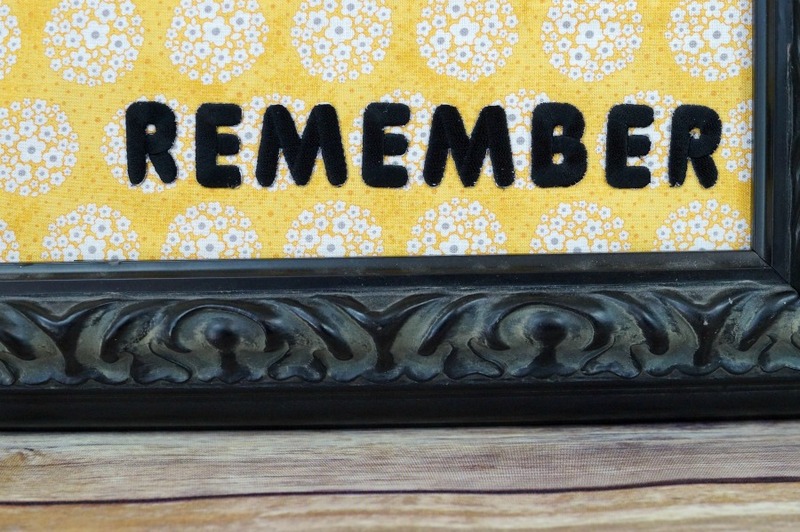 Brush a thin coat of découpage medium on each side of the blocks to adhere the papers. 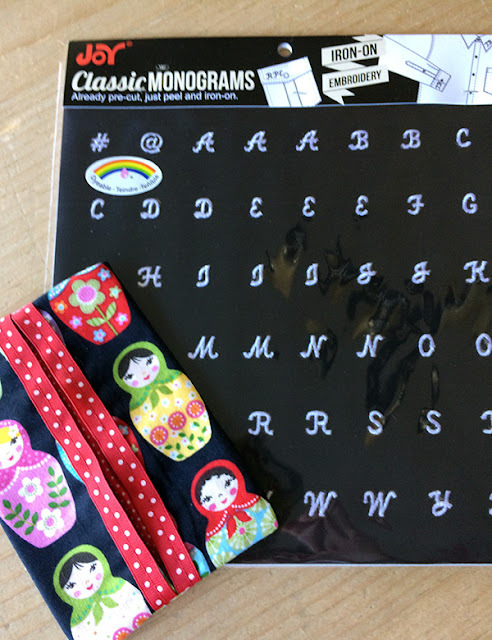 Finish the edges of each block with washi tape. 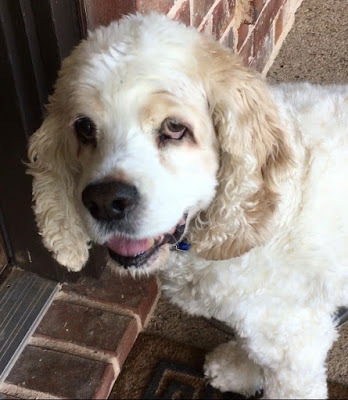 I found a puppy wandering in our neighborhood last week. It had a metal tag on its collar with a phone number so I was able to call the owner and let her know I was looking after "puppy" until she could come and pick her up. 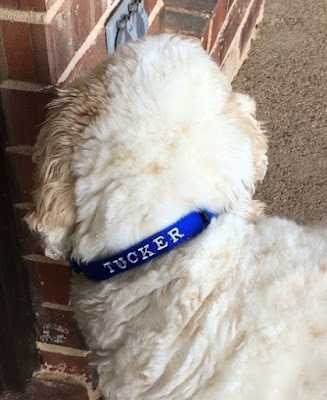 A story with a good ending to be sure, but one that reminded me to make sure my puppy's tags were on his collar and that his name could be clearly seen. 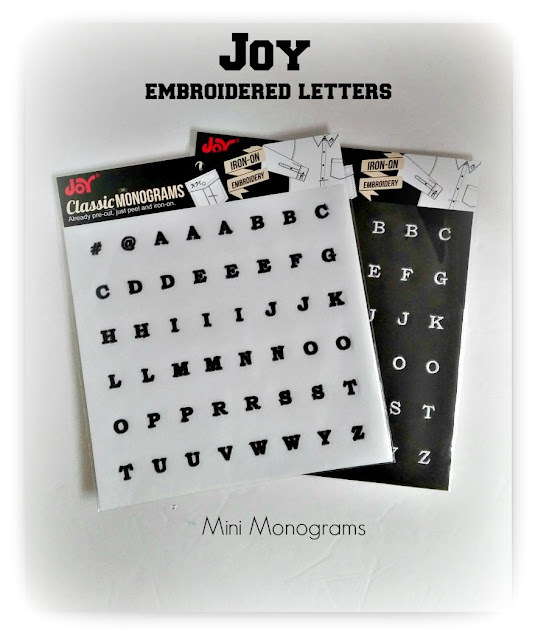 Joy® embroidered letters to the rescue! 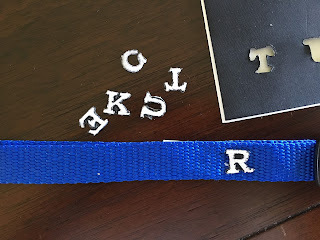 I purchased a new collar at the local pet store and with a sheet of Joy small, classic monogram letters I solved the challenge in no time at all. 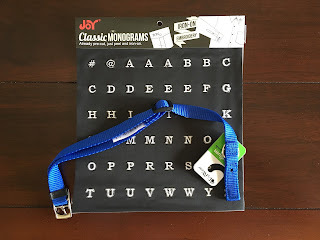 I removed the letters I needed for his name and, following the instructions on the back of the sheet, ironed them one at a time onto his new collar. Now everyone will know his name! You can find Joy embroidered letters at your favorite craft store! 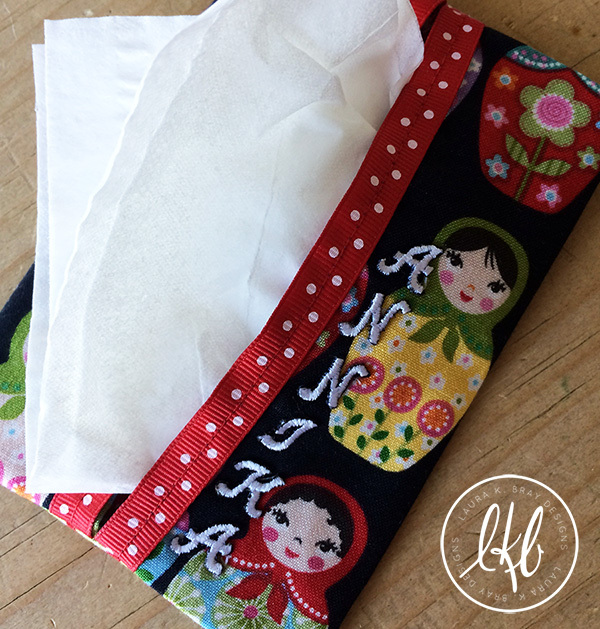 Here's a quick and easy personalized cosmetic bag that takes less than 30 minutes to make! 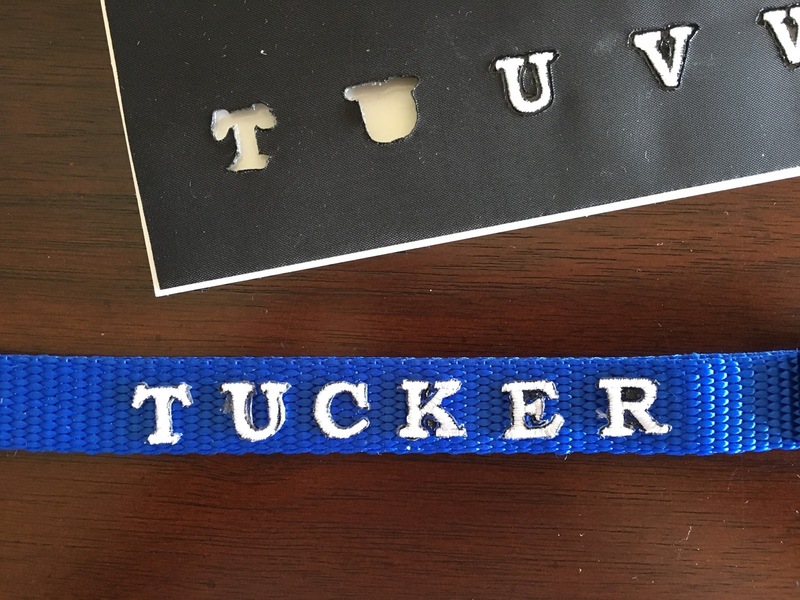 I am always on the lookout for items that I can personalize because I feel that a gift carries more meaning when it has a personal connection to the recipient. Recently I found this cute peach cosmetic bag that just had HELLO on it - it was just calling out to be embellished. The writing on the bag was already gold, so I got out my Joy Gold Script Letters to spell out the word BEAUTIFUL, which fit across the bag perfectly. Since this bag is made from a synthetic material, I decided liquid tacky glue would be better than a hot iron. 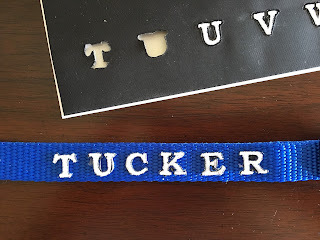 I used a glue with a fine-point applicator for these delicate letters. 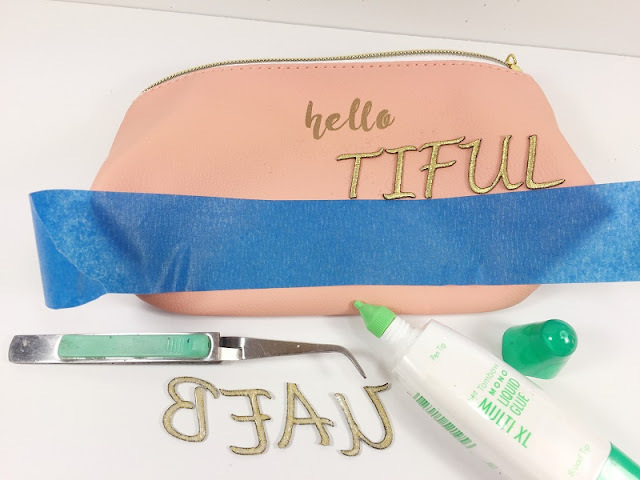 Apply a piece of painter's tape to the bag to keep everything lined up straight, then press the letters into place with tweezers. Start in the middle of the word - then work your way to the right, and then to the left. 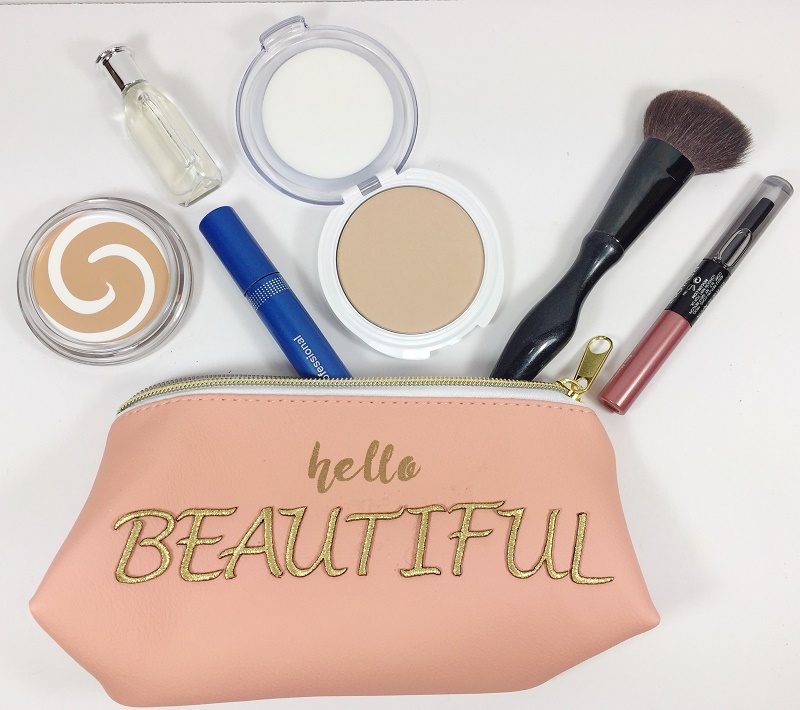 Fill with some fun cosmetics, perfume and nail polish and you have a great gift for anyone who might need a pretty pick-me-up! Use my quick and easy personalized cosmetic bag as a jumping-off point to start creating with joy! 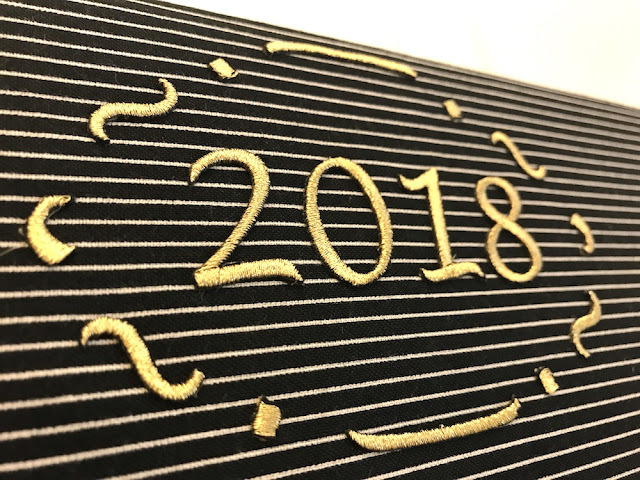 JOY embroidered letters, numbers and symbols are an excellent way to personalize anything and everything - the possibilities are endless. Find them at your local craft retailer in a variety of colors and sizes.